South Sioux City, Nebraska – Service One Transportation, Inc. was presented a Silver and Platinum award by Great West Casualty Company as part of its annual national Safety Awards Program. The National Safety Awards program recognizes motor carriers in similar operations truckload and less than truckload) with awards based on their year-end preventable crash results. Carriers are eligible to receive a Platinum, Gold, Silver, or Participatory award. 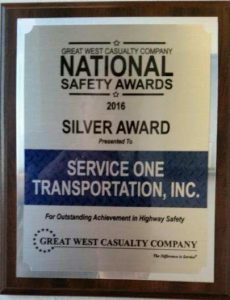 Great West Casualty Company is the nation’s leading provider of property and casualty insurance for the trucking industry. With over 60 years of experience, Great West offers risk management, underwriting, claims, and loss control services exclusively to the trucking industry. Great West is headquartered in South Sioux City, Nebraska, and has regional offices in Meridian, Idaho; Bloomington, Indiana; Knoxville, Tennessee; and Arlington, Texas.